The Bhitarkanika Mangroves are a mangrove wetland in India’s Odisha state. 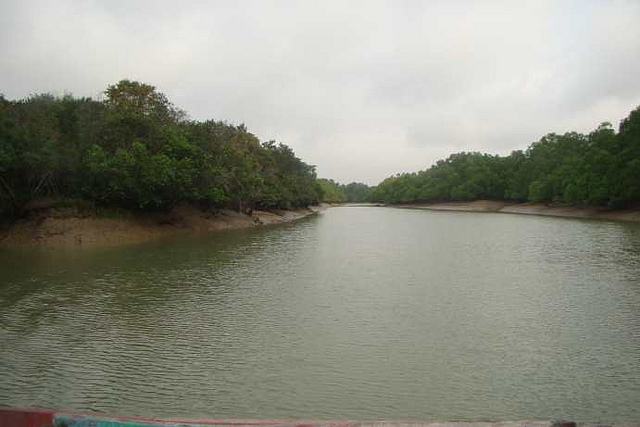 The Bhitarkanika Mangroves cover an area of 650 km² in the river delta of the Brahmani and Baitarani rivers. The Bhitarkanika Mangroves are home to 55 of India’s 58 known mangrove species. The mangroves harbor one of India’s largest populations of saltwater crocodiles. Your best bet is to first reach the capital city of Bhubaneswar (Capital of the Indian state Odisha , earlier called Orissa). From there, it is best that you get a professional tourist company to arrange the visit. In order to see the mangroves and the crocodiles, you need to start early in the morning and it will take about 4-5 hours. So, you need to reach one day early, sleep at night and then start early morning next day. I hired the services of Sand and Pebbles Tours folks. This included to and fro transportation. They gave me a cab which took me to the location, the cab stayed overnight and then returned with me. Not very costly and my personal opinion, get a travel agency. You get to say in the mangroves (or near it) and it is a great experience. First, because you will stay closer to the mangroves, ensure you have enough protection from mosquitoes. I applied the “Odomos” cream (easily available at any pharmacy store) and slept in the tent. Next, ensure you start early in the morning. Do not delay, else the heat sometimes becomes un-bearable as the day progresses. Best time to visit is between October and March. Get a good, big boat. The govt charges are nominal so don’t be a miser. If possible, get a full boat for yourself (if you can afford it, I did and I’m glad I took that decision). We sat on top of the boat for first few hours and had a great trip inside the small canals of the mangroves. Spotted a few crocodiles and other species. You should book a stay with a tourist company. This is a remote area and getting food could be difficult. So find a travel agency which provides you stay and food. See my flikr photostream to see a few pictures of Bhitarkanika. Categories: Photos, Travel | Tags: bhitarkanika, holidays, india, mangroves, odisha, Orissa, travel, vacation | Permalink.